As a mystery writer, I need to create crimes and figure out how the suspect will carry out the dastardly deed. Throughout the rest of the month, I will showcase a few poisons from Book of Poisons: A Guide for Writers to demonstrate different ways to harm and/or murder a person. The book provides scientific information, so I won’t attempt to paraphrase, but give you direct quotes. Disclaimer: Do not attempt the method discussed. The information provided is meant for fiction writing only. Please keep it on the page. Deadly Parts: All, especially the leaves. 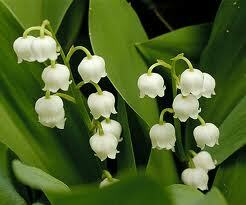 Form: The small, white, bell-shaped flowers are well known. The plant bears orange-red fleshy berries. Even the water in which the cute flowers are kept is toxic. Effects and Symptoms: Symptoms include hot flashes; tense irritability; headache; hallucinations; red skin patches; cold, clammy skin; dilated pupils; vomiting; stomach pains; nausea; excess salivation; and slow heartbeat, sometimes leading to coma and death from heart failure. Antidotes and Treatments: Gastric lavage is recommended, as well as cardiac depressants like quinidine to control cardiac rhythm. 1. The poison is convallatoxin, which is similar to digitalis, a drug that strengthens the contractions of the heart. 2. Found in most of the United States and the Canadian provinces, this spring-flowering plant is also native to Britain, especially the eastern parts. 3. The plant has been mistaken for wild garlic and made into soup. What methods of murder have you or would you use in your writing? I will definitely keep it on the page. It is so important to bring realism into the story this is great information to do that.